I wanted to just talk about the truck brake inspection which when road side checks are made 33% of trucks that are checked get ticket or are shut down.Road side checks are when trained officers pull you over because you are driving with a commercial vehicles. They check to see if you are in compliance DOT . Dot card, CDL, log book up to date ( within 2 hours), They check your vehicle for any safety violations.Brakes are one of the frequent problems. Truck Brake inspection is something that I think drivers are poorly trained at. Companies except us to know it and understand and know all about brakes . This may be true with a driver that has been driving for a while. If he ask enough questions with mechanics or other drivers to understand the detail of the brakes. So lets go over the truck brake Brake inspection; It is very important to go through a brake test before you start your trip. One simple part of the test is when your tractor brake is applied not attached to the trailer. It should hold the unit, let the clutch out slowly and your tractor should not move. 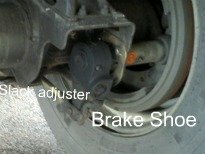 If it does your brake are not adjusted properly. If the mechanic can not fix it. The tractor needs repairs that are more involved tell dispatch you need another tractor. Using the tractor will be unsafe and could cause the brakes to heat up and fail with a heavy load. You are looking at a slack adjuster to the right you can see the brake shoe. Image you have a number 2 pencil not a point on it. If the brake shoe is thinner then pencil you need the brake shoe looked at by a mechanic. Now lets check the brake a little closer. What I suggest to do is start the engine, set your tractor brakes. Push in your trailer valve and listen you should hear air filling airbags if equipped . Should not hear any hissing sound of air leaking. Gauge on dash should level of at 120 pounds and steady. Turn off engine gauge should maintain pressure. If you hear hissing your glad hand could be leaking air. Farther back on the trailer you could have a hose leaking or a brake chamber.There are holes that let air escape when the bake chamber diaphragm goes bad. You will be able to feel the air rushing out which could be a lot or just small amount at first. You will need to call a mechanic to have it replaced. Here is a overview for truck brake inspection. Step one make sure the belt on the air compressor is tight and free of damage. Make sure slack adjusters do not have a movement of more then one inch. The vehicle needs to have the brakes released and wheels chocked. Check and make sure your low pressure warning light works. Do this by turn engine off. Put the key in the on position. Pump Brake until air gauge drops below 60 and the warning light and alarm should come on. Build air pressure up again and turn off engine. 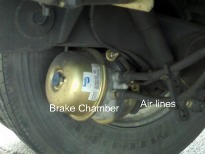 Release parking brake loss of air pressure should be 2psi in one minute, 4 psi with combination. Set Brake and pull slightly to see if brakes hold.